The M18 Cordless 2-Speed 1/4-inch Hex Impact Driver is the most powerful 1/4-inch hex compact impact driver in its class and offers the best power to size ratio among like competitors. Featuring a Milwaukee built 4-Pole frameless motor and optimized impact mechanism, this impact driver delivers up to 2,750 RPM, 3,450 IPM and 1,500-inch lbs. of fastening torque for class-leading performance. This is the only tool in its class to offer multiple speed/torque modes through proprietary 2-Mode DRIVE CONTROL. REDLINK Intelligence provides optimized performance and overload protection using total system communication between tool, battery and charger. The M18 Cordless 1/4-inch Hex Impact Driver features an LED Light to illuminate work surfaces, and includes an all-metal, reversible belt clip for temporary tool storage. 5 Year Warranty. For more information please contact 1-800-628-0525. Now more than ever, today's professional contractors, remodelers, electricians, plumbers and installers alike know that time is money. Studies indicate that professionals can easily improve productivity by reducing time spent searching for tools, sorting through their trucks and organizing supplies. The Bosch Click and Go system allows users to efficiently organize, store and transport their tools and accessories. Bosch's PS41BN is compact and lightweight, making it idea for overhead and tight work area. With a length of 13-1/4 in., a width of 8-1/2-inch and a height of 2-3/4 in., the PS41BN have the shortest height and head length in its class. The PS41BN packs 930-inch per pound of torque, making it very powerful in a compact package. In addition, it has up to 2,600 RPM for fast drilling. The PS41BN includes the tool and Exact-Fit inlay tray only and the battery and L-BOXX are sold separately. Brushless FEIN PowerDrive motor with 30% greater efficiency and longer service life.6-Step electronic torque setting prevents shearing of screw heads.10% higher torque in reverse to release extremely tight bolts. 1/4 inch hexagonal socket for mounting bits and Allen key inserts.Robust, solid metal impact gearbox.Touch guard on drive head.Stands safely on battery.Slim handle dimensions.Compact design.One charger for all voltage classes of FEIN Li-ion batteries.FEIN SafetyCell technology. Protects the battery and the machine from overloading, overheating and deep discharge.3 year FEIN PLUS guarantee, including battery and charger. Bare tool in case, requires battery and charger, sold seperately. The new Hilti SID 2-A Cordless Impact Driver provides great performance in a lightweight, compact package. This tool was designed for professionals who often work in situations where access is limited. The SID 2-A is the ideal solution for driving self-drilling metal screws, small diameter concrete screw anchors and wood screws in environments where these applications exist. M18 18V Li-Ion Cordless 2-Speed Impact Driver (Bare Tool) The M18 Cordless 2-Speed 1/4-inch Hex Impact Driver is the most powerful 1/4-inch hex compact impact driver in its class and offers the best power to size ratio among like competitors. 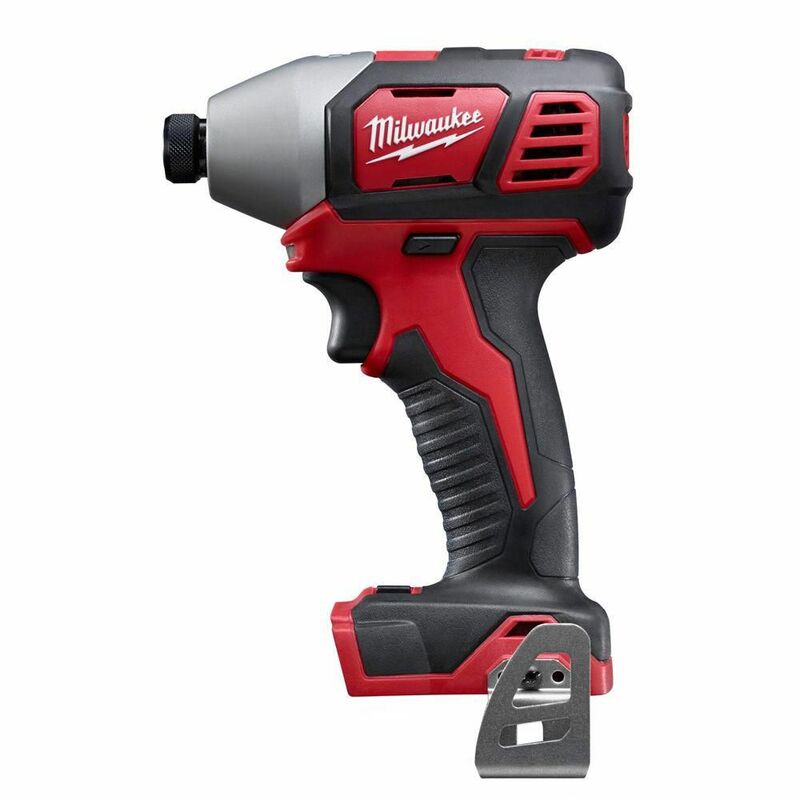 Featuring a Milwaukee built 4-Pole frameless motor and optimized impact mechanism, this impact driver delivers up to 2,750 RPM, 3,450 IPM and 1,500-inch lbs. of fastening torque for class-leading performance. This is the only tool in its class to offer multiple speed/torque modes through proprietary 2-Mode DRIVE CONTROL. REDLINK Intelligence provides optimized performance and overload protection using total system communication between tool, battery and charger. The M18 Cordless 1/4-inch Hex Impact Driver features an LED Light to illuminate work surfaces, and includes an all-metal, reversible belt clip for temporary tool storage. M18 18V Li-Ion Cordless 2-Speed Impact Driver (Bare Tool) is rated 5.0 out of 5 by 14. Rated 5 out of 5 by Randy from I am cabinet maker ( Commercial High End ) in... I am cabinet maker ( Commercial High End ) in high volume custome shop. Use this impact on daily basis with heavy usage. My second one will use nothing else. Absolutely the best and perfect size! Great tool! Rated 5 out of 5 by wisted from Milwaukee tools are the best!... Milwaukee tools are the best! Rated 5 out of 5 by Tom3121 from I would defiantly buy again I use this impact driver for installing 3" deck screws and it is a beast. I've used other impacts in my Constrution business and Milwaukee 2657-20 is the best. Rated 5 out of 5 by Jeff from Excellent driver! Everything I wanted and more from the... Excellent driver! Everything I wanted and more from the Milwaukee base model! Rated 5 out of 5 by C1 from The drill is great. No problems. I love the power of the impact. I like the clip so I can clip it... The drill is great. No problems. I love the power of the impact. I like the clip so I can clip it on my tool belt. I like how it sounds when it tightens a screw.